A close look at a great piece of jewelry can reveal all kinds of dazzling and even surprising details. 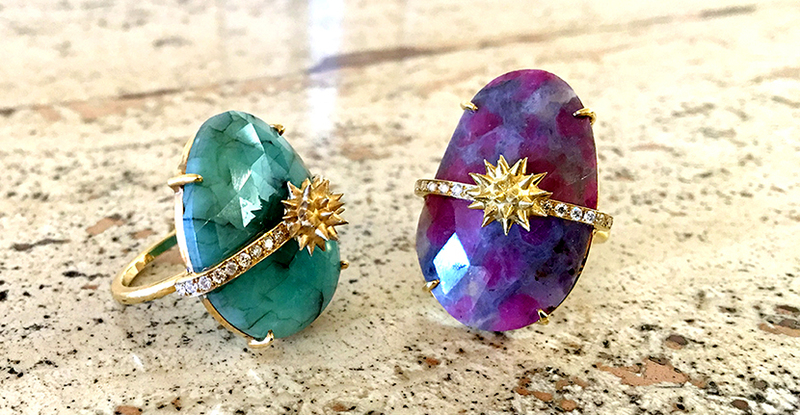 The little gold sea urchins on Suzanne Felsen’s emerald and ruby slice rings are not only impressive miniature sculptures, they also bring to light a bit of the designer’s biography. Ever since Suzanne created her first sea urchins for men’s cufflinks several years ago, she has consistently used them in various designs. Sweet sea urchin stud earrings have become a staple in her collection. These rings put the sea urchins in an ocean-like setting with the mottled background of the sliced gems and the sparkling reflection of the diamonds against the gold echoing the visual of sun against the water .